Supporting leg laminitis should not be confused with unilateral laminitis. Although they both affect only one foot, they are induced in different ways. Generally laminitis is considered to be a systemic disease which affects all feet, with the front feet being most commonly affected. This pattern of a general systemic condition does not explain why only one foot should become laminitic. I would like to highlight a cause of laminitis which means that we will have to make changes in the way each new case of laminitis is assessed. At the core of this model is the relatively rare condition of unilateral laminitis, this condition has always been surrounded by inconsistency as it does not fit the usual pattern found in laminitis. A possible cause of unilateral laminitis can be found in the clinical histories animals which have had the foal condition 'flexural deformity of the distal interphalangeal (DIP) joint' (Fig 1). This is commonly known as 'contracted tendon or ballerina syndrome' by the lay horse owner. The instigating causes of flexural deformities are uncertain at the present time but it's not a contraction of the tendon. A popular current theory being an increase in the rate of growth in the physis or growth plates of the bones of the distal (lower) limb, while the associated deep digital flexor tendon does not grow as quickly. 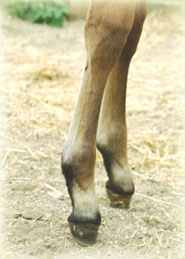 This differential in growth within the structures of the limb result in the foals' foot having a more upright posture than normal. Some foals are born with a congenital form which is considered to be abnormal muscle contracture. In severe cases the heels will not touch the ground as the flexor tendon is shorter than its associated bone structure. These cases are easy to recognise and are usually referred for veterinary treatment. Less severe cases can go unnoticed, particularly if both forelimbs are only slightly affected. Generally foals do tend to have more upright conformation, making the identification of the milder cases very difficult. Problems can arise in the mature horse, when the foot's upright posture is seen as unacceptable and the heels are lowered to 'improve' the appearance of the foot, in the belief that by introducing the frog to weight bearing, the foot will become more open and less boxy (Fig 3). As in the foal condition the heels may have very little ground contact, as the length of the deep digital flexor tendon will not permit the heels to descend fully to the ground. 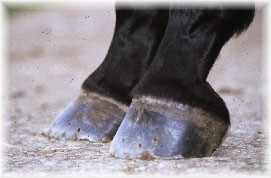 In these cases the hoof capsule is now disproportionately loaded on the dorsal wall and mechanical failure of the laminar attachment is not uncommon in this situation (Fig. 4). In the early stages laminar stretching will become visible on the solar foot surface and intermittent lameness, particularly on hard surfaces, will become evident. Gradually hoof distortion becomes established and the foot takes on the appearance of a typical laminitic foot, with diverging growth rings at the heel and a distorted dorsal hoof wall(Fig 5), while the sole becomes convex displaying a typical 'dropped sole' . Unfortunately, the foot will have all the characteristics of a conventional laminitic foot and will be treated as if it were a typical case of laminitis. Radiographic examination will show the distal phalanx appearing to be 'rotated'. Further heel lowering in an attempt to 'de-rotate' the distal phalanx will be futile, bearing in mind the deep digital flexor tendons involvement, and will probably make matters worse as this induced the laminitic condition in the first place. Once unilateral laminitis becomes established the condition is easily recognisable, the coronary band often dips lower at the toe and the heels are deeper than normal with diverging growth rings. The naturally more upright position of the distal phalanx will leave the distal border vulnerable to excessive pressure which often results in remodelling of the distal border or 'slippering', while the other three feet will be perfectly normal, showing no signs of laminitis. Horses with bilaterally upright feet can develop laminitis when the heels on both front feet are lowered. Over time the symptoms associated with laminitis will become visible, the feet looking essentially the same as in 'normal' laminitis, but there will be no evidence of an underlying systemic disease. Laminitis caused in this way could truly be described as mechanical laminitis, caused by mechanical changes in the way the hoof capsule was loaded during weight bearing. Many farriers will find the concept of laminitis being induced by heel lowering difficult to come to terms with, as it will shift some of the responsibility for the inducement of laminitis onto the farriers' shoulders. This unrecognised cause of laminitis demands a major rethink on how we look at laminitis in general, because now there are two distinct laminitic groups, 'normal' laminitis and a sub-group of laminitis cases induced by heel lowering in a previously upright conformation. Identifying this sub-group of laminitic cases is vitally important from many viewpoints. 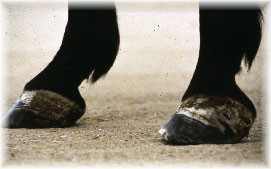 The methods used when trimming laminitic feet will have to be reconsidered, as heel lowering is implicated in the onset of this type of laminitis. The interpretation of radiographs is also complicated by this concept, it can't be taken for granted that the original position of the distal phalanx was at a normal position before the onset of laminitis, it may well have been at 60 degrees or higher (Figs 6 & 7). Therefore trying to reduce its angle will be impossible as the deep digital flexor tendons length prohibits the distal phalanx being positioned at a normal angle. It is because bilateral laminitis caused in this way looks essentially the same as systemically induced laminitis that it has remained undetected for so long. Identifying and acknowledging the existence of this sub-group of laminitic cases will prevent future cases of laminitis being caused in this way. 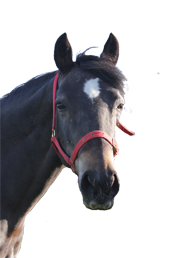 Identifying these cases is difficult and relies on the normal causes of laminitis being absent, particularly obesity or other systemic diseases. The presence of signs of treatment for a flexural deformity in the form of desmotomy scars or a history of previously upright conformation helps conform that heel lowering may have caused laminitis. Another helpful diagnostic factor is the complete absence of any evidence of laminitis in the hind feet, which will be perfectly normal. Over the past decade the role of the deep digital flexor tendon in laminitis has been questioned, with some believing that it plays a major part while others have disagreed, perhaps both camps are correct. In 'heel lowering induced laminitis' the deep digital flexor tendon will have a major causal role, while in the systemically induced cases it will not have influenced the situation at all. Unfortunately, there are exceptions to all rules, a horse with naturally upright conformation can still have systemic laminitis! In my experience laminitis caused by heel lowering is very difficult to deal with. My efforts have concentrated on not lowering the heels but to allow them to grow longer or to raise the heels with some form of wedging, this measure does allow the heels to become load bearing and reduce the loading on the deep digital flexor tendon. Prevention will always be better than cure. 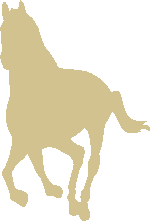 By recognising that a particular horse has a naturally higher than normal hoof angle and leaving it that way, we will be doing the horse a great service. Very few problems are associated with upright conformation when it is accepted for what it is. Inflicting preconceived standards of conformation onto the non-standard horse will only inflict pain and misery on the horse in the long term. Unilateral laminitis should not be confused with supporting leg laminitis, although they both affect only one foot, they are induced in different ways. When a major injury occurs to one limb, the other limb is called upon to carry the full weight of the horse for extended periods of time. Over time the supporting limb develops laminitis, probably because blood flow within the hoof capsule is inhibited by continuous loading. The heels of the hoof continue to grow and the differential hoof growth causes the hoof capsule to distort and laminitis develops. Grooving, support heart bar shoes, and Equi-Pak soft sole support has been used in this situation with good results.